In the spirit of the approaching Thanksgiving holiday, I have been working on a Gratitude Tree. Inspired by this post, I think I’m going to incorporate this creative symbol of appreciation as part of my gratitude practice all year long. I started to collect small branches around my neighborhood and workplace until I had a nice bundle to use for the foundation of the tree. 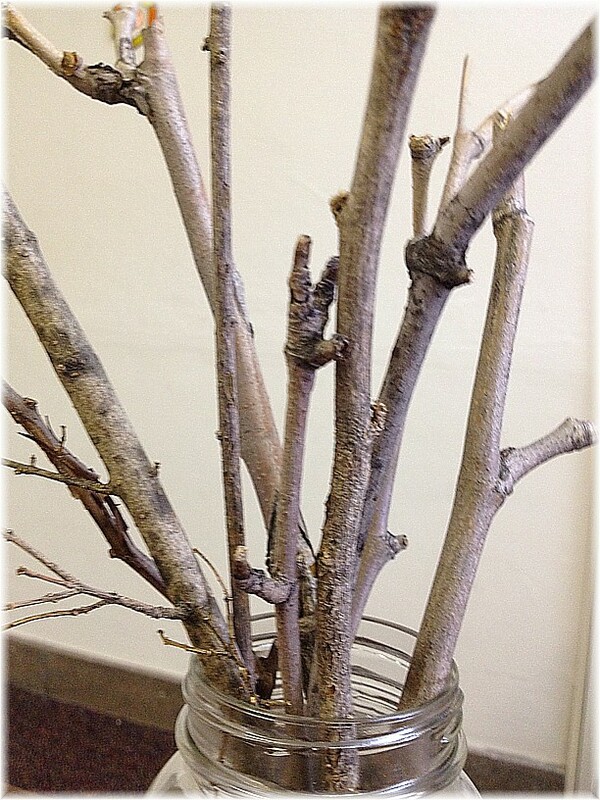 These branches went into a mason jar filled with sand, stones, glitter, and other fun bits. Using some textured scrapbooking paper, I cut out leaves and punched a hole in each of them. With embroidery thread, the leaves (also referred to as blessing tags by some!) were threaded so they could hang from the tree’s branches. On the paper leaves (with a little distressed ink, of course) I wrote or rubber stamped some of the simple, good stuff in my life I am so very grateful for: health, kindness, family, growth, friends, support, love, art & creativity, and appreciation for the abundance in my life. Little notes of thanks associated with each of these blessings are written on the back of the leaf. I have so, so much to be thankful for this year. I look forward to adding to my Gratitude Tree in the upcoming year as 2013 flourishes. 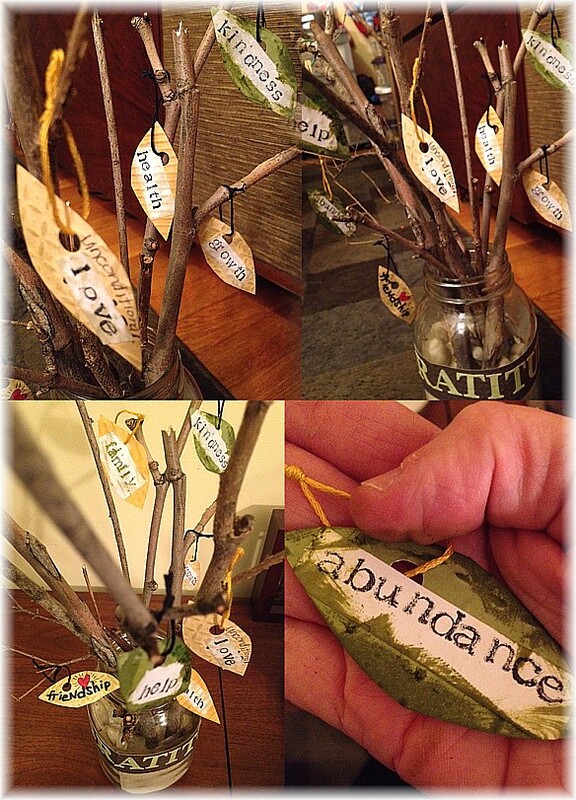 What “blessing tags” would be on your Gratitude Tree? Need some more Gratitude Tree inspiration? Check out these Gratitude Tree Pinners on Pinterest. This entry was posted on	November 20, 2012 at 8:36 am	and is filed under creativity, gratitude, ideas. Your tree is beautiful. I’ve been reading your blog for some time and always enjoy it. I have a similar tree that I made with leaf shaped paint chips from home depot. I call it my “living the questions” tree, and while it’s not specifically focused on gratitude, creating the leaves and admiring them definitely takes me to a place of gratitude. This is quite simply awesome–thank you for introducing me to this practice…I’ve been thinking about how to tie the end of 6 Degrees 2 into my 21 day workshop…and I think I’ve got an idea! Patty–I like the notion of “living the questions” as well-a neat twist. 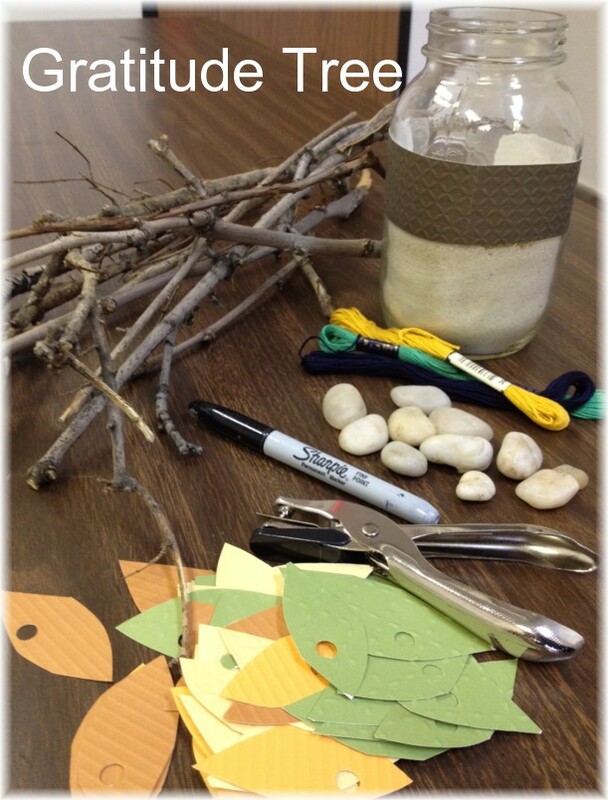 It was lots of fun to create this tree- preparing the materials, putting the tree together, and spending time thinking about what to put on the leaves— I’ve got a stash of extra leaves so I can keep on adding to it… I love the paint chip idea Patty- and your living the questions theme…. Can’t wait to see what this inspires for your Mindful Studio Practice Hannah….. Thanks all for the kind feedback and interest! Reblogged this on My Wellbeing and Learning Journey.